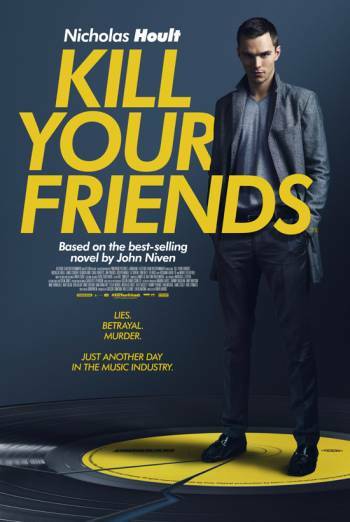 Summary KILL YOUR FRIENDS is a comedy thriller about a young man working in the music industry in the 90s who goes to drastic lengths in order to deal with the competition and stress of signing new artists. KILL YOUR FRIENDS is a comedy thriller about a young man working in the music industry in the 90s who goes to drastic lengths in order to deal with the competition and stress of signing new artists. There is occasional very strong language ('c**t') and frequent strong language ('f**k'). A man is choked and then repeatedly hit in the face with a blunt object; the injury becomes increasingly bloody. A character is stabbed in the neck and lies in a pool of blood on the floor. There is sight of a dead character's limbs being hacked off and placed in a suitcase. Characters use cocaine and pills frequently throughout the film. There is a scene in which a character sniffs poppers in a club. There are references to paedophilia when a character is arrested after images were found on his hard drive.